The sun rises above Donner Lake the morning of March 6, after the Tahoe regionâs most recent winter storm dropped anywhere from 3 to 5 feet of snow at higher elevations. Read more: Visit http://bit.ly/2n1lDmW to read a summary of the UCLA study on Sierra snowpack and climate change. 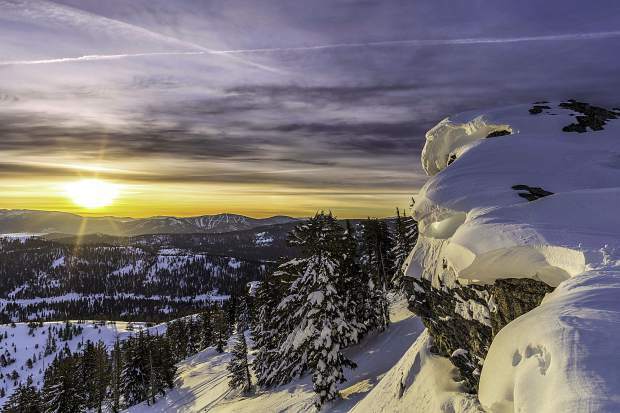 This story has been updated to correctly report Sierra Nevada snowpack levels (as of March 1) in feet in the "By the numbers" section. An earlier version of the story incorrectly reported the measurements were in inches. The Sun regrets the error. SODA SPRINGS, Calif. — Mitch Brown jammed the blade of his loader into a two-story pile of snow outside Donner Ski Shop, the sports rental store he runs in Soda Springs. From there, Old Highway 40 toward bustling ski resorts was lined with walls of snow more than 20 feet high. This winter’s bumper crop of snow — on the heels of the worst drought in 500 years — underscores the threat to this central source of water for western Nevada County and most of California. That’s because winter snowpack is a giant reservoir. In the watershed that supplies the local Nevada Irrigation District (NID), even average snowpack holds enough water — all by itself — to supply customers for one year. And because temperatures this winter are expected to stay cold at higher elevations, that reservoir will stay on the mountains until summer, when it’s needed. But, as the world’s climate grows warmer, California’s most important water source is growing less reliable, experts warn. Two winters ago — the driest of northern California’s recent four-year drought — the snowpack was about one-tenth what it is now. “We lost a 125,000-acre-foot reservoir that year,” said NID Operations Manager Chip Close. 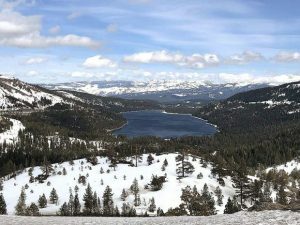 Snowpack will shrink even more by the end of this century, according to a study released March 9 by the Institute for the Environment and Sustainability at the University of California, Los Angeles. During a drought like this recent one, if current climatic conditions continue, snowpack would plummet to 15 percent of what it was in 2012-2015. New projections, based on satellite data and other records, show that “nearly all snow is lost at elevations below 8,000 feet,” wrote UCLA researchers Neil Berg and Alex Hall. “Losing 85 percent of that snowpack severely threatens the ability for California to rely on melted snowpack as a primary source of drinking water,” Berg wrote. Such droughts, other research shows, will come more often and grow more severe. During an average winter with cold temperatures, the snowpack sits on the mountains. Reservoirs get some water from rain and run-off, but remain less than full. Demand for water stays low, too. “We’ll draft off the reservoirs to service the customers downstream,” said Keane Sommers, who manages NID’s 10 high-country storage lakes. On April 15, NID’s agricultural customers start getting their water. Farmers start irrigating, people plant gardens, and demand for water picks up. In May, snowmelt starts flowing in earnest into streams, rivers and reservoirs, peaking just as people need water the most. “The snowmelt will refill the reservoirs and keep them full into the early summer months,” Sommers explained. But this year’s soaking rains create a headache for water managers across the state: All that water in January and February came too soon. Big swings in California’s weather from year to year are normal. Most of the state’s water infrastructure was built on the assumption that plentiful snowpack would always be there — not every year, but often enough to keep the system flowing. But scientists say those swings are getting bigger as the climate warms. 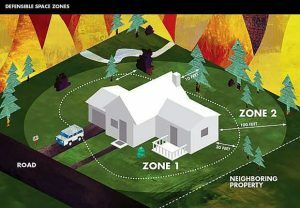 This means overall less snowpack — and less water. Few years are really “average,” according to recorded snow levels in the Sierra Nevada and historic levels based on the measurement of tree rings. Some years — including 2017 — get more snow than average. Over time, however, most years see less snow than average. And some years, way less. In 2015, “snowpack level was the lowest in the last 500 years,” said scientist Soumaya Belmecheri, of the University of Arizona’s Laboratory of Tree Ring Research. “Severe droughts are a regular feature of the state’s climate, occurring every 15 to 40 years,” added the Public Policy Institute of California, a center where some of the state’s top water researchers pool their knowledge and concerns. “It is difficult to attribute this (most recent) drought … to climate change, which generally is a long-term shift in conditions,” wrote Public Policy Institute members in 2015. “Yet this drought’s characteristics are consistent with projections that California’s climate is becoming warmer and more variable, with wetter wet periods and drier dry periods. “Climate projections also suggest that droughts will become more frequent,” PPIC members concluded. So up to now, drought has been figured into the “average” snowpack. But the “average” is getting drier, and not just in California. Studies using 17 state-of-the-art climate models of the American Southwest all “project significantly drier conditions in the later half of the 21st century compared to the 20th century and earlier,” wrote researchers led by Benjamin I. Cook in 2015, published in Science Advances. And that means less snowpack in the future, despite this year’s abundance. Furthermore, that decline is happening now, according to the UCLA study released Thursday. Scientists Hall and Berg found the Sierra Nevada snowpack during the four-year drought was 25 percent smaller than it would have been without human- induced warming. “Seeing a reduction of a quarter of the entire snowpack right now — not 20, 30 or 40 years from now — was really surprising. It was almost as if 2015 was the new 2050 in terms of the impacts we were expecting to see,” Berg said. When the environment is changing so rapidly, new approaches to water supply are difficult, but urgent, said NID General Manager Rem Scherzinger. Trina Kleist is a freelance writer living in Grass Valley whose clients include Nevada Irrigation District. She may be contacted at tkleistwrites@gmail.com.